Every year, two leading edge ham radio groups get together and have a dinner on Friday of Hamvention weekend. AMSAT is one group; they are at the forefront of ham radio communications via satellites. TAPR is the other group; they are on the forefront of ham radio digital communications and I am a director of TAPR, as well as its secretary and newsletter editor. These two groups are my peeps and represent some of the makers and shakers of ham radio. These are the people I look up to and are in awe of for all they have done for ham radio over the years. As I said in my bio, "My fondest memories of ham radio are rubbing elbows and making friends with the makers and shakers of our hobby who show up at Hamvention every year." I have attended this dinner every year for over 25 years and since 2010, I have attended as a woman. When I attended as a guy, I mixed in with the other dinner attendees chatting and joking about ham radio and other gizmos. That changed when I began attending as a woman. Presenting as a woman to a predominately male group who had known me previously as a guy was very daunting and I did not mix well. It got a little better over the years, but usually I would buy a drink when I arrived, stake out a table for me and my friends and be seated to wait for the speakers to speak and food to be served. This year was typical. I sat down and saved a couple of seats. Folks filled up the other seats. One asked me if I was a ham or the wife of a ham. I said that I have been a ham for almost 40 years. When I told him my callsign, he reacted as if he was familiar with my callsign, but he looked a little confused and couldn't place me... well, you know why. Anyway, this year, the speakers and food were very good and around 9:30 PM, 150 people were ready to call it a night when the president of TAPR returned to the dais one more time. He asked me to stand up, congratulated me for winning the Special Achievement Award and urged the audience to give me a round of applause. Not only did 150 of my peeps applaud, but they all got up and gave me a standing ovation. It was a very emotional moment; my eyes began to tear up and I almost lost it, but I smiled and said thank you over and over again. What a moment! I will cherish it forever. 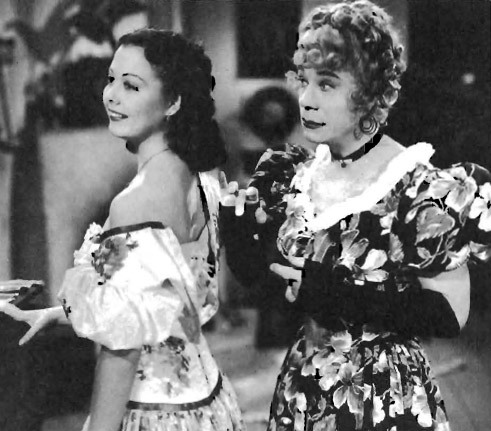 Joe E. Brown (right) in the 1944 film Shut My Mouth. Even more affirmation that you've arrived. Now, your mission, should you choose to accept it, is to get out of your chair next year, use those gorgeous gams that God gave you, and get out there and mingle with your peers. Use the energy you turn on when you lecture at colleges and become the power babe in the room. Just a thought. Again, congratulations on the award. My late wife received a similar type award from the national association of her specialty in the nursing world, and it meant a lot to her - I could feel it energize her. Yes - next year I will feel more confident. I am already looking forward to it. I'm so happy you've found so much acceptance from your HAM Radio peers. I have read your posts about HAMVENTION and your peer "HAMers" for the last 4 or 5 years. 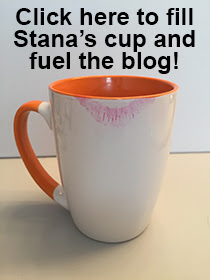 Generally, if I remember correctly, reactions have been positive when your peers finally realize that Stana is the "Stan" they knew. I think you once posited that acceptance of you being transgender may have been higher in the HAM community than the general population because HAM Radio enthusiasts are generally more intelligent, open-minded, and better educated than the general public. That makes sense ... the more educated and intelligent a person is, the better chance she or he may open to differences in others and less likely to be bigoted. Brava to you, Stana, and Bravo to all your male HAM peers that are accepting you as a woman. Thank you, Sheila. I have encountered only one ham who knew Stan and had trouble accepting Stana. He may have been more surprised than upset... I never followed up on it as he was just a distant acquaintance, not somebody close. Lovely to see everyone standing up for you in more ways than one.. I will never forget it, Abigale! I remember your first conference as Stana (2010?). I think you were a "Booth Babe". What a fantastic journey and I am so glad you let us come along. I look forward to reading about your continued success. Your success helped me decide to start mine. Thank you so much. You are very welcome, Susan. I wish you even more success than I have had. I'm proud of you, Stana. It's very challenging to become your new identity in old contexts. I'm in small such struggles now daily with old friends, and very recently, after coming out to family. Congratulations, and thanks for your leadership! Well done. Really well done! I'm so proud of what you have achieved in your field.